AUGUSTA, Maine, March 23 (UPI) — Police in Maine were sent out to ruffle some feathers and break up a fight between two bald eagles. 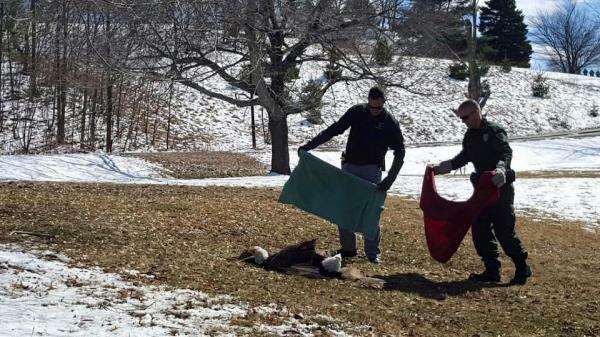 Augusta Maine police department shared photos of the scuffle between the eagles as officers used towels to separate the two endangered birds. “The Eagles were literally locked together by the talons and our very own ACO Roodman and Warden Ross responded for a report of the bald eagle street fight,” police wrote. “Sure enough the two of Americas’ Finest were found, locked and unable to separate.”Video also shared by the police department shows the eagles sitting perfectly still as two officers slowly approach the birds with towels. The two eagles quickly disengaged as the officers drew nearer and quickly flew away. On 3-22-16 ACO Roodman and Game Warden Ross separated two eagles locked together at the Augusta Arsenal. “The wild animal specialists used blankets to separate Americas’ Symbols of Freedom who were later seen flying over the August Arsenal,” police wrote. “It’s a proud day in Augusta for these two majestic winged warriors!